Growing up in the small community of Long Shop Virginia the memories I cherish are around people , events and really good food. Meals were prepared and enjoyed over long conversations with laughter and love. Halloween was an event I look so forward too with planning of costumes, decorating the big house into the haunted manor, and of course the hommade goodies that were prepared in the neighborhood you had to have! Miss Allie always made hommade popcornballs , Miss Trudy did cookies, Grandma Deweese had hand pies or cake and My Momma did the famous candied apples. Times were simple and safe and we could run all over the countryside house to house getting the goodies and seeing the neighbors. If it was a good scary night- ghost tales around the candy we counted spread all across the living room floor. 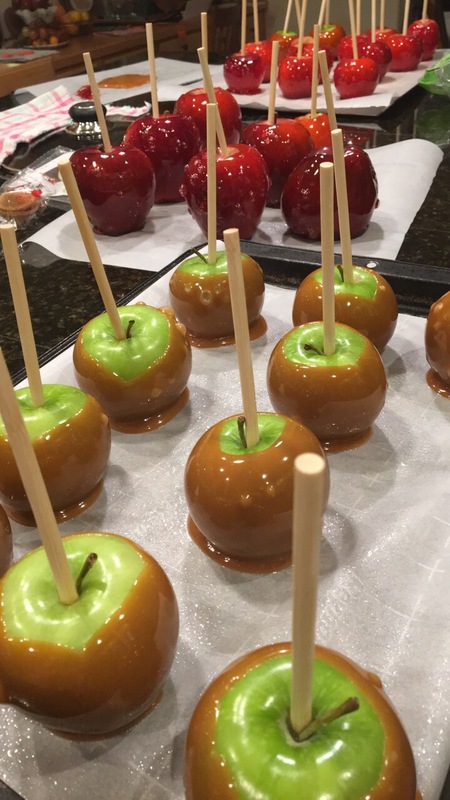 I continue the apple tradition with candied apples and now caremel too. I share with children I know their families. The kids start asking about the apples mid summer if Im still making them with excitement and antisapation. Im so happy those fun memories live on and continue to excite and thrill in such simple ways. Be safe and love one another but most important make memories that last! Wrap after cool or they will get gummy overnight. Previous postWarm sticky cinnamon buns…cold weather favorite!